This is not simply a std::pair typedef because the members should be named clearly as they both have an integer type. Definition at line 71 of file MachineBasicBlock.h. Definition at line 76 of file MachineBasicBlock.h. Definition at line 74 of file MachineBasicBlock.h. Definition at line 73 of file MachineBasicBlock.h. 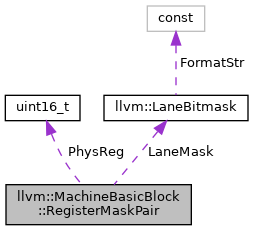 Referenced by llvm::MachineBasicBlock::isLiveIn(), llvm::MachineBasicBlock::removeLiveIn(), and llvm::MachineBasicBlock::sortUniqueLiveIns().